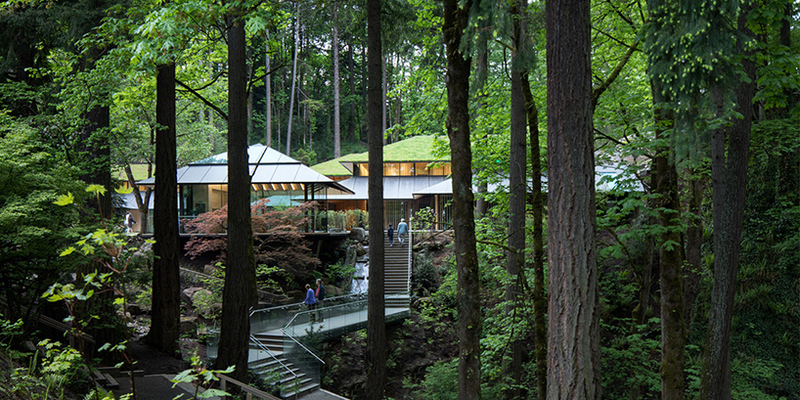 japanese architect kengo kuma has completed the expansion of the portland japanese garden, a historic site that first opened to the public in 1967. located within washington park in the west hills of portland, oregon, the venue is considered to be one of the best and most authentic traditional japanese gardens outside of the island nation. 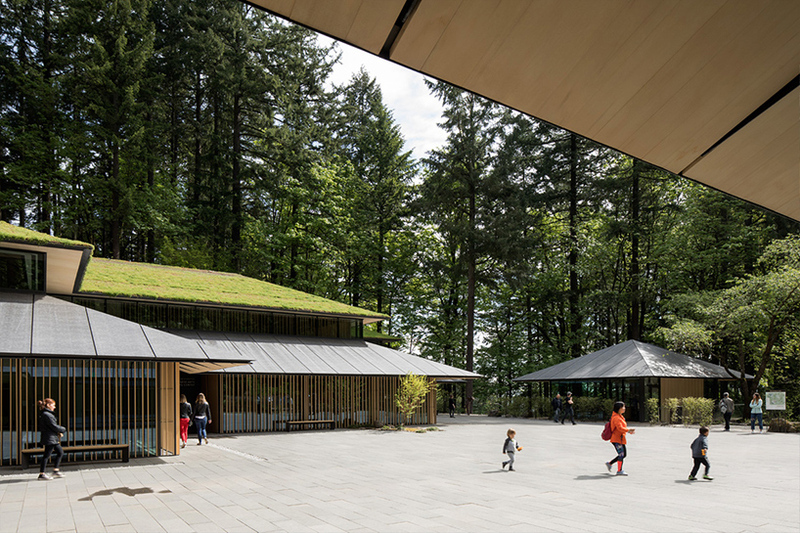 comprising three structures, kuma’s intervention, which has been under construction for the past few years, not only expands the garden’s footprint to accommodate increasing visitor numbers, but also allows for better immersion in japanese arts and culture. 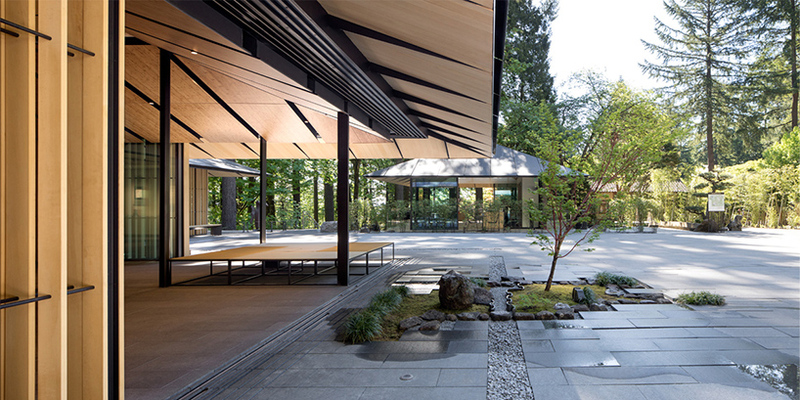 kengo kuma worked closely with portland japanese garden’s curator, and third generation master garden craftsman sadafumi uchiyama, to design the new ‘cultural village’, which cost a total of $33.5 million USD. 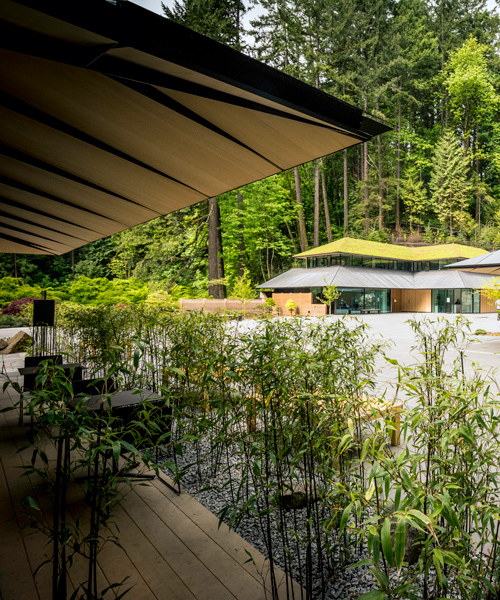 the design reused and optimized the site’s existing land, adding 3.4 acres of usable space to the 9.1 acre property. 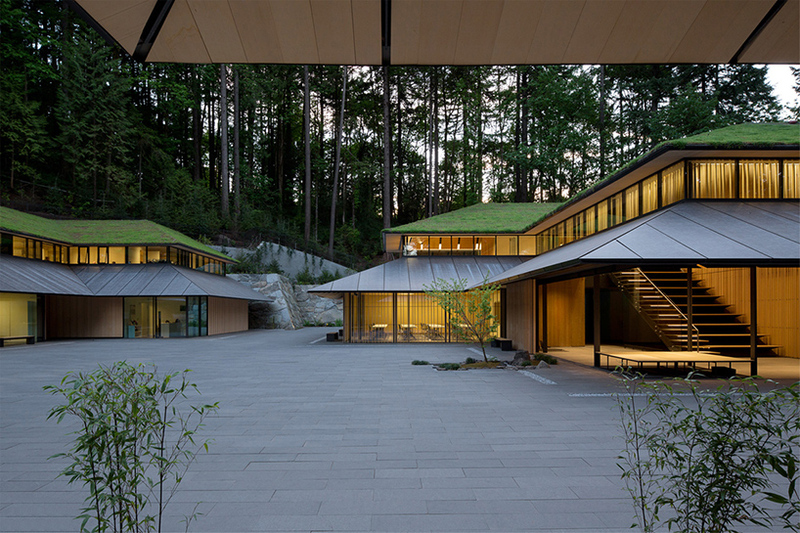 articulated around the tateuchi courtyard, the composition of new buildings emulates japan’s monzenmachi, the gate-front towns that surround sacred shrines and temples. 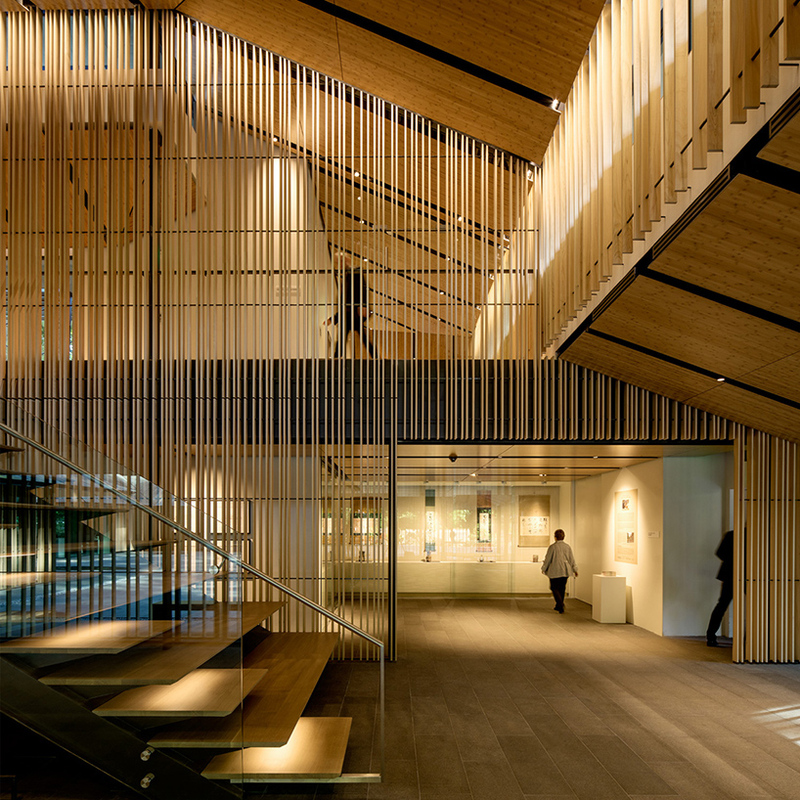 ‘we aimed for a cultural facility like a village, suitable for a human city integrated with nature,’ says kengo kuma. 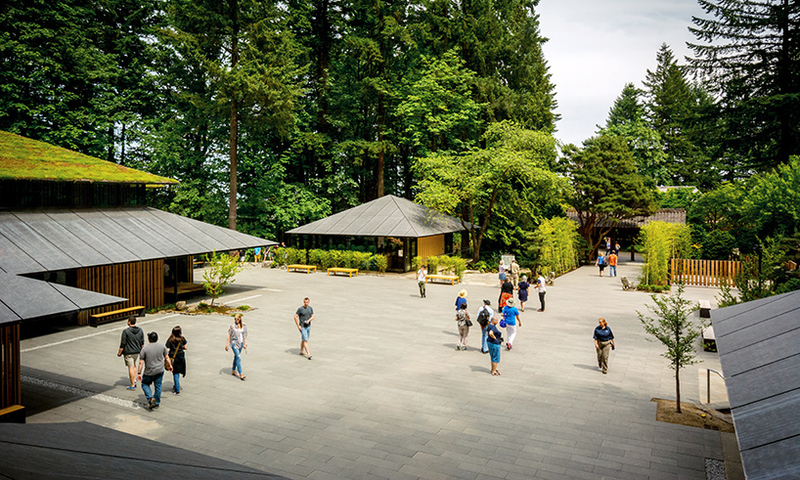 the largest of the three buildings is the jordan schnitzer japanese arts learning center, which contains a gallery with year-round exhibitions, a multi-purpose classroom, a ‘cultural corner’ showcasing demonstrations and music, a gift shop, and a library that offers resources on japanese gardening and related arts. 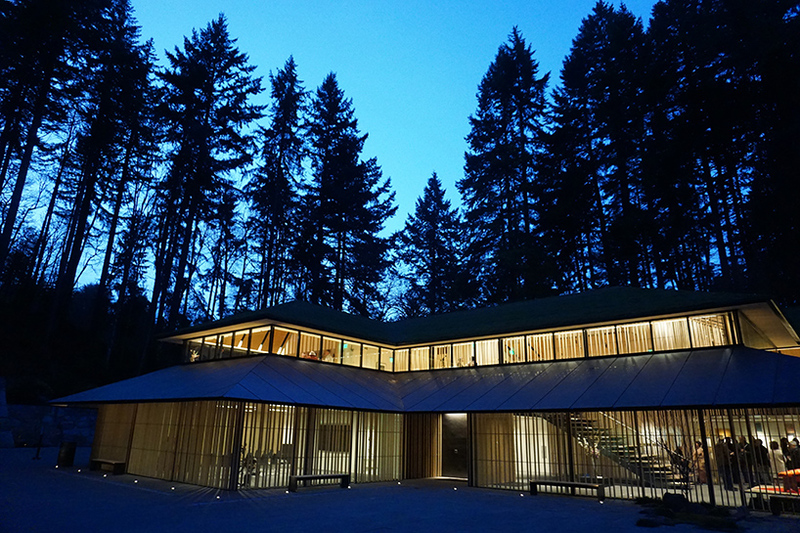 meanwhile, a garden house offers an expanded range of horticulture workshops, and a café perched on the hillside provides a place to rest while experiencing japanese tradition firsthand. 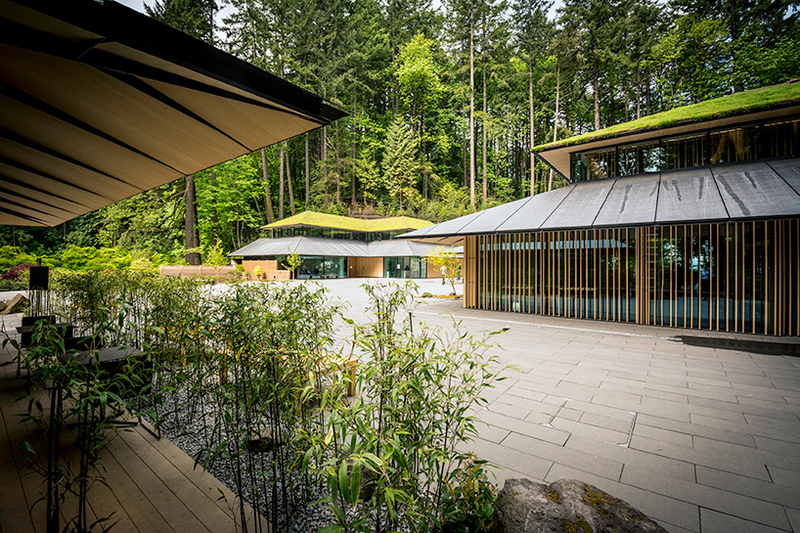 all three of the structures are LEED-certified, and have been designed to ensure that nature remains as the site’s focal point. as part of the project, the garden added 24 geothermal wells beneath the cultural village plaza. the wells were bored 300 feet down into the earth to take advantage of the moderate temperatures in the ground, boosting energy efficiency and reducing the operational costs of heating and cooling the buildings. furthermore, to ease pressure put on the city sewer system by rainwater runoff, garden curator sadafumi uchiyama designed a stone creek to run from the top of the hill to the entrance. the creek will channel runoff into a holding tank, hidden below the parking lot, where it will slowly release into the sewer. 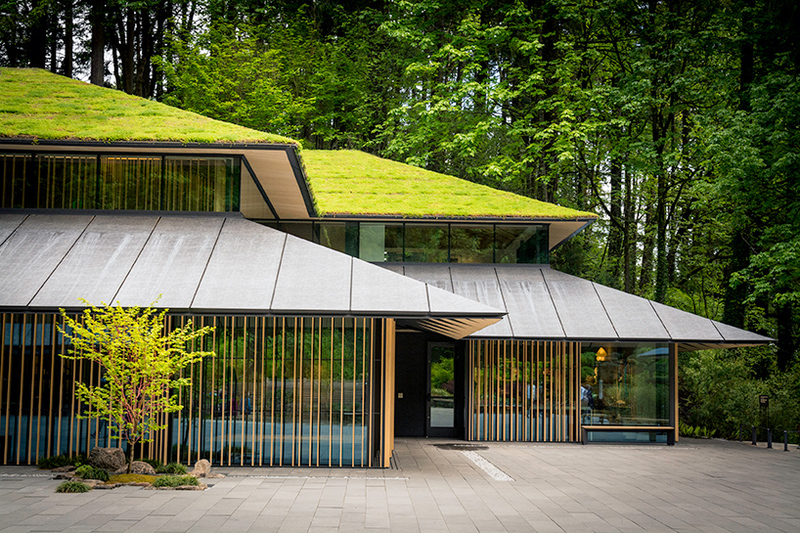 large sliding window walls allow access to light and fresh air, while living roofs absorb rainwater and minimize run-off. the designers have also introduced hundreds of plants, shrubs, and trees to create an environment with reduced erosion, better soil health, and improved air quality. 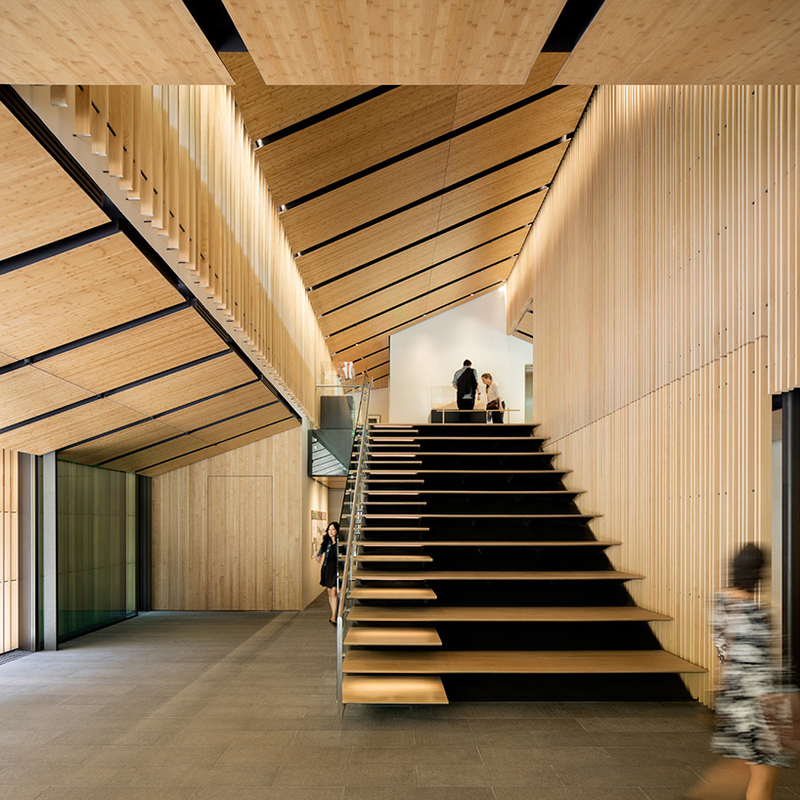 ‘ecologically responsible and environmentally conscious design is very important in our approach,’ says kengo kuma.